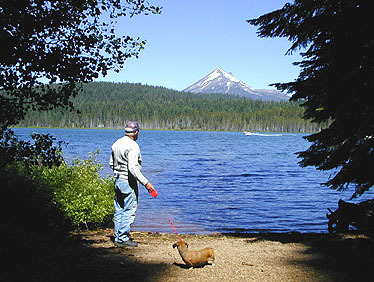 Lake of the Woods, 5,000 ft.
South of Crater Lake Park and east of Medford lies a mountain land blessed with dozens of gorgeous lakes, some large and well-developed, like Lake 'o the Woods, and many smaller lakes accessible only by backpack or horse during the summer months. This photographer is especially charmed by the highly variegated mix of deciduous and coniferous trees in this region of Oregon. This area near Lake o' the Woods and the Klamath Falls Basin is a real Oregon "must-see" in the fall when the aspens do their magic and the first snows dust the higher peaks. 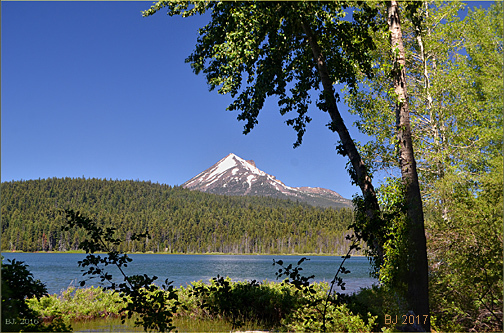 Across the Lake rises Southern Oregon's highest peak, the extinct volcano of Mt. 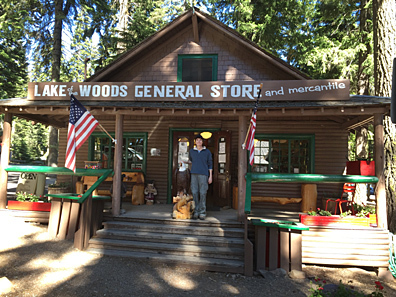 McLoughlin, 9, 500 feet in elevation, which I have climbed four times over the many years. This view across the northern portion of the lake is from aptly-named Aspen Point. 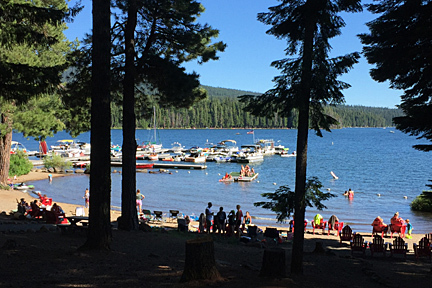 Below: the main resort area on the east side of the lake has a well-stocked store, cabins for rent, a fine mountain restaurant, and even has an open air stage for bands. I enjoyed a group when I was there in 2016, with a rocking female vocalist backed by some great horn players! And it was free! (New!) To the top of Mt. McLoughlin at 9,500 ft.